A rescue group that saved 1200 animals after Hurricane Katrina is back at work in Louisiana. Overnight they moved 67 animals to safety from the St. Bernard parish [county] shelter to a donated farm near Folsom, Louisiana. Volunteers from Pasado's Safe Haven, based in Monroe, Washington, took 45 dogs and 22 cats to the 600 acre farm. 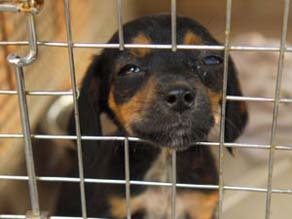 Among the canines rescued were 8 puppies dumped in the shelter parking lot. The St. Bernard Shelter has just two employees, and does not have the kind of funding it would take for such a major undertaking as relocating all of its animals. The visiting rescue crew arrived at the farm about 9pm Saturday night, then walked the dogs and cleaned their cages after the journey from the shelter. Some of the volunteers spent the night on air mattresses in the barn with the animals. But Pasado founder Susan Michaels said the real work will start after Gustav hits. "Our biggest concern is that a lot of animals will be left behind," said Michaels. During hurricanes Katrina and Rita in 2005, some residents perished or were stranded when they refused to leave their homes and go to shelters because they could not take their pets. The state of Louisiana made some changes to prevent that kind of tragedy again. Their major focus was on citizens with special needs. Those with small animals, 15 pounds or less, could bring their animals with them on evacuation buses. Larger animals were crated and transported to two special shelters where pet owners would be near their pets. Those shelters are in Shreveport and Alexandria, Louisiana. And while there are some other pet/human shelters, state officials have been urging the general population to take care of their pets with the same care as they would any other family member. "From the commissioner's office to the state veterinarian, we have all been preaching personal responsibility. Planning for an emergency is part of being a responsible pet owner," said Sam Irwin, press secretary for the Louisiana Department of Agriculture and Forestry. –Be able to lift a minimum of 50 lbs. –Be willing to muck stalls, clean kennels, walk dogs. –Have upbeat attitude. No WHINERS. More information is available at the Pasado web site. Wednesday morning, a groan went up in the CNN newsroom as several of us viewed the latest forecast track for Tropical Storm Gustav - projected to strengthen, possibly to a Category Three hurricane. Nearly three years to the day after Katrina flooded New Orleans and leveled much of the Mississippi Coast, we were looking at the possibility of Hurricane Gustav doing the same thing. Gustav has brought heavy rains and floods to the Dominican Republic, Haiti, and Cuba. Late Wednesday, the storm took an abrupt left turn. Instead of skirting north of Jamaica, Gustav could now score a direct hit on Jamaica and the Cayman Islands. Next stop is the bathtub-warm waters of the Gulf of Mexico - 87 or 88 degrees Fahrenheit in some places. With precious little wind shear to knock the storm down, it's a recipe to cook up a major hurricane, possibly hitting the U.S. Gulf Coast by Tuesday. If Gustav stays on its current track, it'll pass through the Gulf of Mexico offshore oil fields, offering a possible repeat of the damage and disruptions caused by Katrina, Hurricane Rita a month later, and by Hurricane Ivan in 2004. Oil markets are already edgy, with a dollar-a-barrel jump on Wednesday blamed on the risk from this storm. That's one thing. 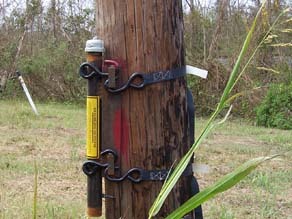 A repeat of Katrina's damage would be another. If this storm does indeed hit New Orleans and the Mississippi Coast, will it be a knockout blow for a struggling region? As of Thursday morning, the forecast track has shifted a bit to the west of New Orleans. Either way, it's time to say a prayer for the Gulf Coast, and for one of the most unique cities on earth. There are two other tropical systems worth watching. A tropical depression, located about 400 miles east of Puerto Rico, could reach hurricane force and threaten the Bahamas next week. Another system could form in the mid-Atlantic over the next few days. Here's the next installment of our "Get Your Game On" series, in which CNN.com speaks to experts about what's hot in video gaming. This week, G4TV's Morgan Webb discusses the new games kids will be buzzing about in the halls and around the water fountain as they head back to school. 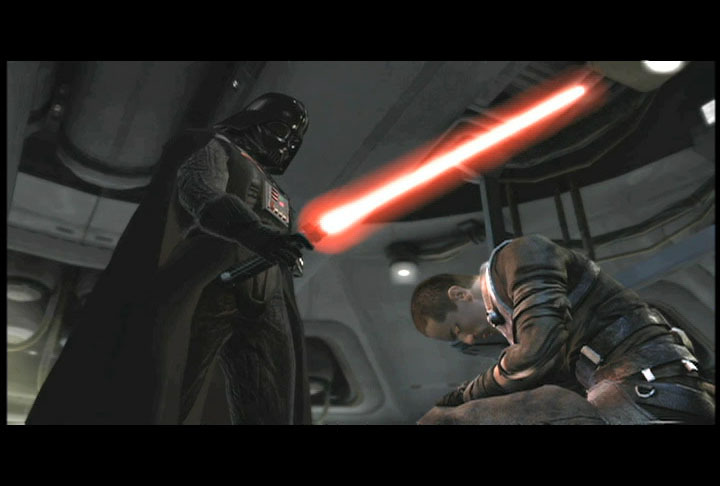 A scene from "Star Wars: The Force Unleashed." - "Madden NFL 09," reinvents the series with upgrades to previous modes as well as such new ones as Madden IQ, Online Leagues, and Madden Moments. If there was ever a season to come back to the series, this is it. Throw on some pads and get back into the game. - "Star Wars: The Force Unleashed" lets you become Darth Vader’s secret apprentice and use your light saber to fight the remaining Jedi hiding in the universe. Discover what it's like to feel the powers of the dark side at your disposal. - "Rock Band 2" brings the crew back together with new ways to customize your music experience plus new modes such as the Battle of the Bands that pits your quartet against other rockers from around the world. In case the new additions aren’t enough, artists like Pearl Jam, Bob Dylan, AC/DC, and Metallica will have you playing to sold-out virtual crowds long into the night. - "Warhammer Online" might come from the people who first made a name for themselves in the tabletop arena, but it’s already gaining loyal supporters in a fight for MMO dominance. The big idea this time around is the realm-versus-realm play that will pit you against an entire army intent on your demise. - "Spore" takes you on a journey from a single cell in a tiny drop of water to a full-fledged civilization by letting you design, evolve, and ultimately control the fate of your own virtual species. From the genius who brought you "The Sims," this evolution game, due Sept. 7, is easily one of the most anticipated of the year. Attention all seafood lovers. Put down your forks, knives, and crab mallets for a moment and listen up. According to the National Marine Fisheries Service, Americans consume close to 5 billion pounds of seafood annually. But that’s only a third of the marine life the U.N.’s Food and Agriculture Organization estimates fishermen discard globally each year as bycatch, or species unintentionally caught in fishing gear. What’s more, the FAO classifies 75% of the world’s fisheries as either fully exploited or overexploited. Scientists today may understand the environmental consequences of overfishing and harmful fishing practices, but for the Average Joe it’s not so cut and dry. It’s difficult for regular consumers to know whether their seafood dinner is simply tasty protein or a contributing factor to a fishery’s collapse. 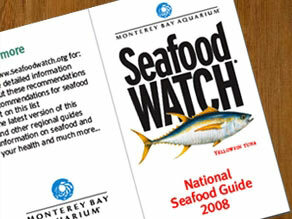 The Monterey Bay Aquarium Foundation is trying to change that with their newly updated Seafood Watch Pocket Guides. About the size of a credit card, the Seafood Watch Pocket Guide fits easily into any wallet. But it’s the information inside the guide that’s really impressive. Based on fisheries’ management, sustainability, and environmental impacts, the Pocket Guide ranks common seafood products into three categories: Best Choice, Good Alternative, and Avoid. It also gives advice on seafood to avoid for health reasons, such as the increased mercury and other contaminant levels in species with high fat content. The Pocket Guide is updated twice a year to ensure seafood recommendations correspond to current events in the world of fishing. For example, the new version removed California and Oregon wild-caught salmon from the guide altogether because the fisheries were recently closed to fishing. (Watch this for more information). Seafood Watch hopes the guide will help consumers make smart choices when purchasing seafood at restaurants, grocery stores, and even sushi bars. Seafood Watch distributes its national and regional Pocket Guides through partner organizations across the United States and Canada. You can download your own guide at www.seafoodwatch.org or get it on your cell phone by pointing its internet browser to mobile.seafoodwatch.org. U.S. government scientists are one step closer to publishing a rule aimed at protecting the endangered North Atlantic Right Whale from ship strikes. The National Oceanic and Atmospheric Administration (NOAA) filed its final environmental impact statement Monday, seeking public comment on its proposal to slow down commercial ships along parts of the East Coast where slow-moving right whales are found. This is one of the most endangered of mammal species; only about 300 of the animals remain. 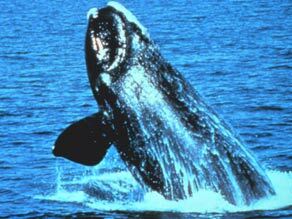 NOAA is proposing a 10-knot speed limit in right whale feeding grounds in and around Cape Cod, Massachusetts, and inside the "calving grounds" off Jacksonville, Florida. The slowdown also applies to a 20-mile "bubble" near mid-Atlantic ports where and when the whales are migrating. The original proposal by NOAA scientists more than a year ago called for a 30-mile caution area around ports. The shipping industry has been adamantly opposed to this rule. The World Shipping Council, representing more than two-dozen companies, told the government that such a speed limit would botch tightly controlled container ship schedules, make it more difficult for big ships to maneuver, and cost money. 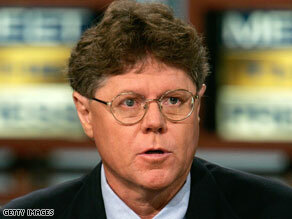 These concerns sparked an internal debate within the Bush administration and delayed the rule. A final rule should have come out of the Office of Management and Budget over a year ago. Right now, experts say commercial ships kill about two North Atlantic right whales every year. Even that number could mean the end of the species, according to both NOAA scientists and conservation groups. How many of us leave our computers on when we step away? Do we think about how much energy that is wasting? With one click a European company wants to help lessen our carbon footprint along with saving us money. The Eco Button is a plug-in USB device. When you take a phone call or step away from your office you can just press the button and your computer goes into an ultra low powered sleep mode that only uses 1.8 watts. This is a bit of an improvement over a traditional sleep mode of 3 to 5 watts. Just press the button again and your computer will instantly start right where it left off. The device shuts down everything except for essential memory. Software can be downloaded to let you know how much electricity, carbon, and money you are saving by using the device. The device can be bought currently at http://www.eco-button.com and is going for 15 pounds which is about $28.00. Some U.S.-based Best Buy stores were giving these devices away a few weeks ago to Reward Zone members that showed up for an after-hours sale. So it is safe to say that Americans will soon be able to press the button to go green. Would you use it if you had it on your desk? Working in a modified shipping cargo container may not sound like a great assignment for a scientist. But several amphibian experts in Atlanta are welcoming the chance to study a dozen frog species in a new facility at the Atlanta Botanical Garden. The 40' by 8' container, or "amphibian pod" is biosecure, so that no pathogens (any microorganism that can cause disease) go in or out of the facility. The pod is also "green." Water coming out of it is treated and re-used at the Garden. "The temperature is similar to Panama where all the frogs came from, 80 degrees during the day and 62 at night," said Ron Gagliardo, amphibian conservation coordinator at the Garden. Why frogs at a botanical garden? In the early '90s, Gagliardo set up a poison dart frog exhibit at the Garden. "The visitors went crazy. It was a great way to hook visitors to conservation issues," said Gagliardo. And as conservation issues go, no animals could use attention more than amphibians. Amphibians– you remember from elementary school, they live on land, breed in water– include frogs, toads, newts, salamanders, and caecilians. (Caecilians are burrowing, wormlike creatures.) And about a third of the 6,000 species are declining or endangered.The World Conservation Union's Global Amphibian Assessment estimates since 1980 at least 122 species have already become extinct. The pod concept began at a research center in Melbourne, Australia. The scientists in Atlanta are working to streamline and standardize the tanks, lighting and water systems so that the pods can cheaply be operated in developing countries in Central and South America where they are needed for captive breeding programs. But frogs and salamanders don't have the same prestige as pandas and polar bears... the "charismatic megafauna" that help conservation groups raise money. They also tend to be studied less. 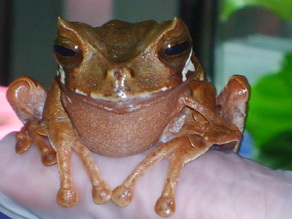 "We have less of a knowledge base about amphibians," said Dante Fenolio, amphibian conservation scientist at the Garden. Right now one of the biggest threats to amphibians is a deadly fungal disease known as Chytridiomycosis, or chytrid (pronounced kit-rid). Habitat loss, pollution, invasive species and climate change are other dangers they face. 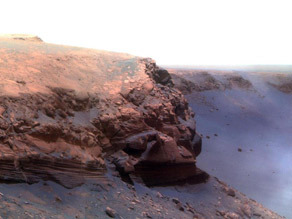 "This is a catastrophic problem," said Fenolio. "We know very little about environmental toxicology," he said. Chytrid is now found on every continent except Antarctica, (where there are no amphibians). The fungus kills by interfering with an animal's ability to move water and air through its skin. As the fungus spreads through Central America, several rare frog species (the marsupial frog, lemur leaf frog, and glass frog) are now in a breeding program at the Garden, a joint project with Zoo Atlanta. Jenny Cruse-Sanders, a plant evolutionary biologist who is director of research and conservation at the Garden, said having frogs on display is a great way to educate the public. "People are always asking, 'What can I do?'" said Cruse-Sanders. "We want to keep people engaged and informed, to keep up a sense of hope and action," she said. A coalition of science and conservation groups has declared 2008 "The Year of the Frog." You can find out more at Amphibian Ark, whose mantra is, "Keeping threatened amphibian species afloat."